There are few things more annoying than weeds growing where you don’t want them, especially when every step was taken to prevent weed growth. Weeds can be very determined little devils, but a properly installed patio with paving stones is not likely to be overrun with weeds. 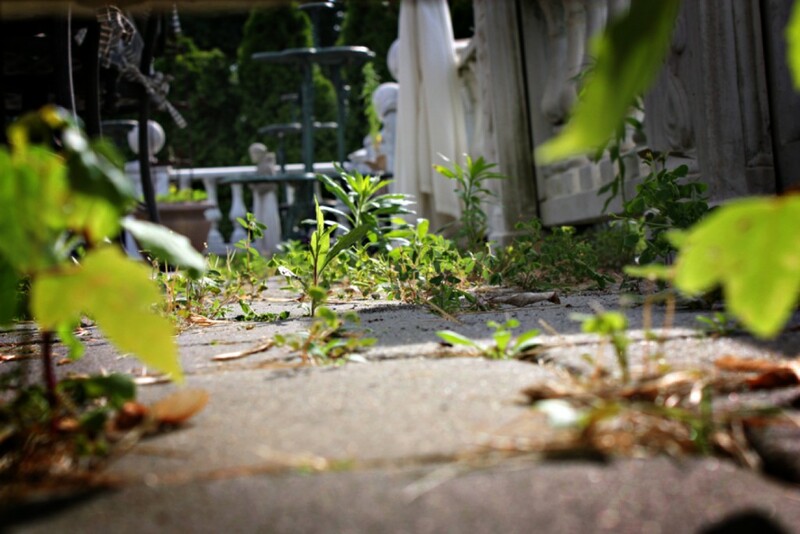 If you have weeds growing between your patio paving stones, we have some tips to get rid of and prevent weed growth. Not ‘maintenance’ in the typical sense, but rather a simple sweeping of your patio pavers. Sweeping your paving stones helps to prevent seedlings from settling, it also helps disrupt the establishment of new weeds. 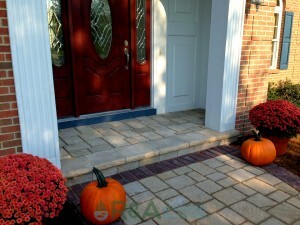 Also, make sure the location of your patio pavers has sufficient drainage. Some weeds tend to prefer cool damp environments, so proper drainage helps avoid establishment and growth of weeds. If your patio pavers are overrun with weeds…we don’t recommend removing them all by hand, that would be some very tedious work! However, if you have a few large weeds growing in the joints those are easily plucked by hand. Chemicals are the go to for killing weeds for many homeowners, but you really need to be careful here. Some patio paving stones will discolor when harsh chemicals are used on them. This is the last thing you want to happen to your paving stones. We have heard white vinegar helps kill weeds, if you go this route, make sure to test an area and check for any discoloration. A pressure washer can really help to quickly remove smaller weeds. However, your patio stones are sitting on a bed of compacted sand, which makes them level. If you try using a pressure washer to remove weeds, and you’re not careful, you may end up blasting the sand beneath the pavers, as well as removing the jointing material. Jointing material is pretty easy to replace, but the sand beneath is a different story. A pressure washer can do a great job at cleaning your paving stones and bringing them back to their original look (or close to). If you find that your patio pavers are overrun with weeds or you would rather have a professional bring your patio back to it’s original condition, contact us today and see how we can help. Also, check out additional projects we have completed if you’re considering upgrading your outdoor living area.